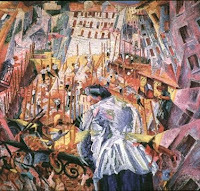 The Italian Futurism is the first art movement that can be considered an avant-garde movement. They introduced with their art an ideological interest that affected deeply culture and even social costumes, when denies all the past, substituting it by stylistic and technical experimentation. 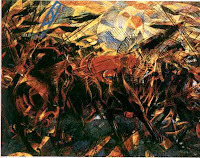 It officially began with Marinetti’s manifesto in 1909 and was signed too by Balla, Carra, Boccioni, Russolo and Soffici. The avant-garde movements are a phenomenon typical of non well developed countries in which the movement appears as a rebellion in front of the official culture, normally moderate, and they align in the side of progressive political movements. Even being intentionally revolutionary, their effort is more polemic. In the futurist manifest they mention the destruction of historical city and museums and they appeared in favour of the new city, imagined as a machine in movement. Their revolution is the industrial or technological revolution, this is, a bourgeois revolution. In the new civilization the machines, the intellectual-artists represent the genius. The futurists define themselves as anti-romantic, and they want to follow their own moods so works are highly emotive. They exalt science and technique but they want them to be poetic and lyric. They assure they are socialist, but they are not interested in working class fights and they consider the intellectuals of avant-garde as the aristocracy of the future. When they have to choose in politics they prefer the nationalism. The movement lasted until the end of WW1 but it was dissolved after it. The characteristics of the movement were their interest in an art forged out of the beauty of speed and a glorification of war. The physical movement, as long as speed is concerned, is the cohesive factor that allows the fusion of object and space and, finally, the elimination of the basic dualism of the traditional culture. The unit of the real should not be produce in the thoughts but in sensations, in an emotive way. The artist must underline dynamism to make it more emotive.